Teh’Beli is a Twilek of the rare subspecies Lethan, those that bare bright red skin, born on Naos III to a pair of poor Twilek spice miners. Her parents cared for her as they could with what little they had, but Lethans are particularily prized as slaves, specifically in entertainment. During her 10th cycle, slavers from a powerful spice lord invaded the family’s small hovel, killing her parents and taking her into slavery. She quickly formed a deep seeded hatred and resentment for her ‘masters’ and was never quite fully submitted, causing small problems wherever she could for the slavers. In her 18th cycle, the spice lord that took her came to her bedroom, as he often did, but this time was different, Teh’Beli would have no more, feeling her hatred build with every step that monster took towards her, she lifted her hand screaming ‘NO MORE!’ crude arcs of lightning extending from her hands and incapacitating the spice lord, taking her opportunity she relieved him of his blade, then drew it across his neck. Grabbing what few possessions she had, she quickly made her escape into the streets of Naos III. The next seven cycles were much of a blur to her. Taking the odd job here and there, smuggling this and that and the occasional assassination mission. She carved out a small place for herself in the harsh landscape of Naos III. Training her body, and steeling her mind against the horrors inflicted on her, and in turn those she inflicted on others to get by. Rarely putting down her vibroblades, and using them to feed herself, though her eyes always looked to the stars, where she could escape the hell hole that her family was taken from her on. During this time, she had not been able to summon the lightning to her again, hearing whispers of a new colony settling the planet of Viscara, with assistance from the Republic, and where the Republic was, inevitably, there were Jedi. 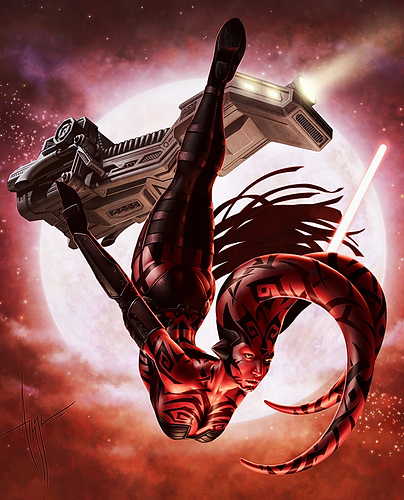 Teh’Beli continued to work till she could afford passage to this new colony, and once arriving met a blue skinned woman, telling the young twi’lek of an organization that could help her deepen her connection to the Force, ‘Finally’ she thought, an organization known as Duskhaven. Looks good to me! You’ve got my approval. Contact a DM ingame for your experience bonus.